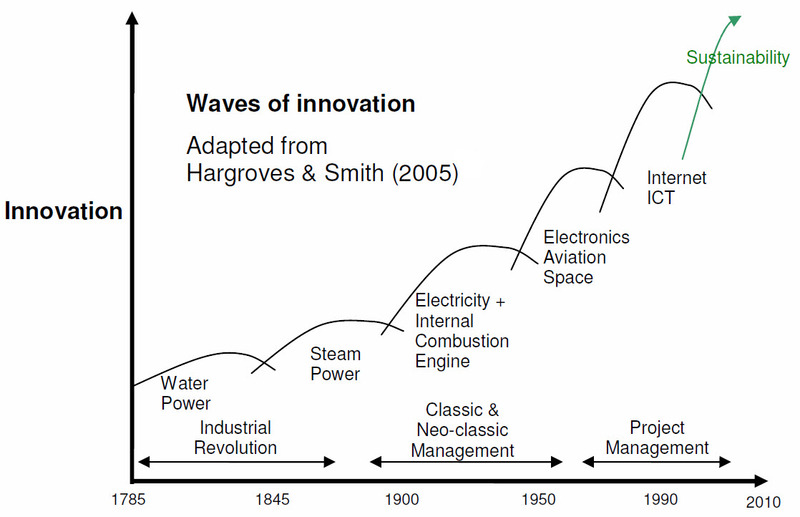 One of the key papers is The Origins of modern PM, this paper takes a brief look (page 8 on) at the evolution of management theories .compared to the waves of innovation that drove the ‘industrial revolution’ and advancements in society through to the modern times. Fighting advances in technology is pointless, as the Luddites discovered. The origin of the name Luddite is uncertain, a popular theory is that the movement was named after Ned Ludd, a youth who allegedly smashed two stocking frames in 1779, and whose name had become emblematic of machine destroyers. What is certain is the Luddites were 19th-century English textile artisans who protested against newly developed labour-replacing machinery from 1811 to 1817. The stocking frames, spinning frames and power looms introduced during the Industrial Revolution threatened to replace the artisans with less-skilled, low-wage labourers, leaving them without work. What actually happened was the rise of the UK Midlands into an industrial powerhouse. There were winners, losers, and exploitation but overall the changes in society were to the general good. What is not realised in the current debate around global warming and coal is that electricity produced in coal fires powers stations is a straightforward extension of steam power that came to dominance in the 1840s and is as inefficient as any other steam powered engines. What the electrical distribution system does is allow the energy derived from burning the coal to be transferred to remote locations ‘away from the fire’ for use as needed. It is convenient and electricity fuelled the next wave of innovation, but is also inefficient. The typical thermal efficiency for utility-scale electrical generators is around 33% for coal fired plants, 66% of the energy in the coal is wasted Then an additional 30% to 40% of the power is then lost in the transmission from the power station to the consumers (mostly in local distribution, the main grid only loses between 5% and 8% of the power). The net result only about 25% of the thermal value of the coal is available in your home or business! This gross inefficiency is only affordable because the industry does not have to pay to clean up its pollution; most of the waste is simply discharged to the atmosphere. The raw material is not particularly safe either; around 5000 people per year are killed mining coal. Other innovations include various wind, and other generation processes that create power close to where its needed as well as renewable base load capabilities; all that is needed is the critical mass to make the technology cost effective (ie, cheap) and leadership for government to manage the changes and help the industries and people on the ‘losing’ side of the equation and plot a path into an exciting future, particularly for skilled project professionals. As the Luddites discovered, fighting to defend a losing technology is a guaranteed way to ensure you lose. Unfortunately, I’m still wondering when the Luddites in Canberra are going to realise the burning of coal to create pressurised steam is an invention of the 18th century, which largely replaced water power as the energy source of choice. And, that after 300 years the world is moving forward but Tony Abbot and a range of other backward looking ‘conservatives’ want to keep dragging us back into the past. Australia needs leaders in Canberra and our State capitals, not Luddites – fighting to preserve 18th century power source in the 21st century is guaranteed to fail eventually. And what is going to be lost focusing on the past is the opportunities to gain from the emerging technologies, a lose-lose outcome. A well planned and executed change paradigm exploits the strengths of existing capabilities, encourages the development of new innovations and manages the transition to the future whilst minimising the losses. This transition is good for project management but cannot happen without effective leadership. 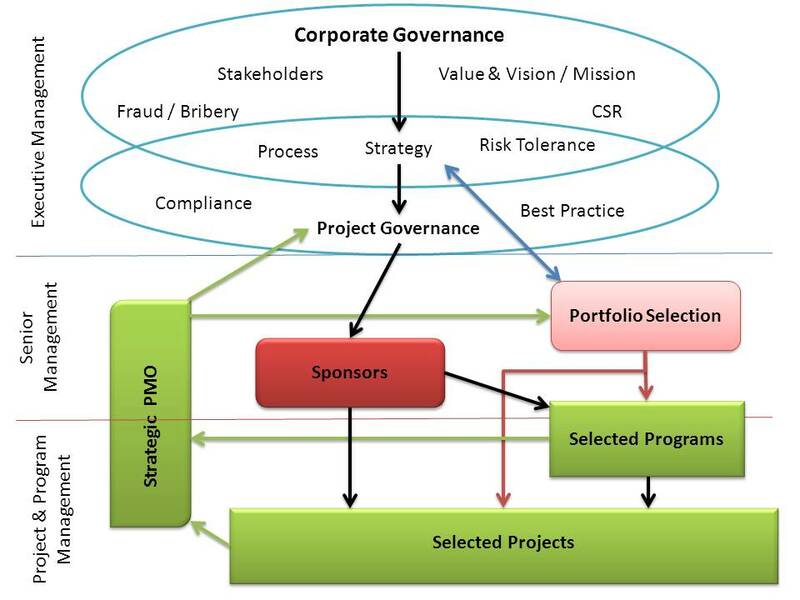 In 2012 I contributed to a scholarly article discussing The management of project management: A conceptual framework for project governance, with Eric Too from the University of Southern Queensland as lead author. After an extended wait, the International Journal of Project Management has at last published the paper in its current November edition, along with nine other papers discussing governance. I will post some commentary on the overall theme of governance as framed by the ten papers shortly. Projects and programme support: the effective support and management of projects and programmes is the measure of an effective governance system. 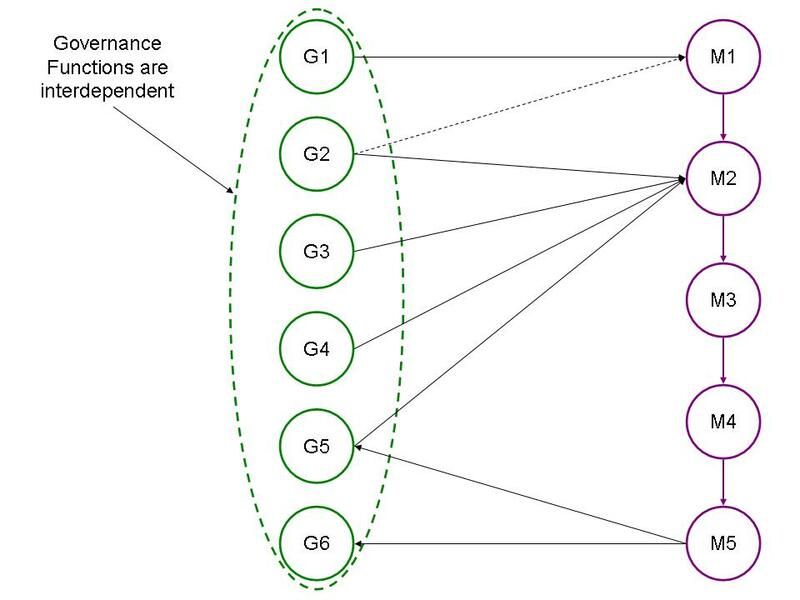 The purpose of the framework described in the paper is to provide guidance to organizations in the development of effective project governance to optimize the management of projects. 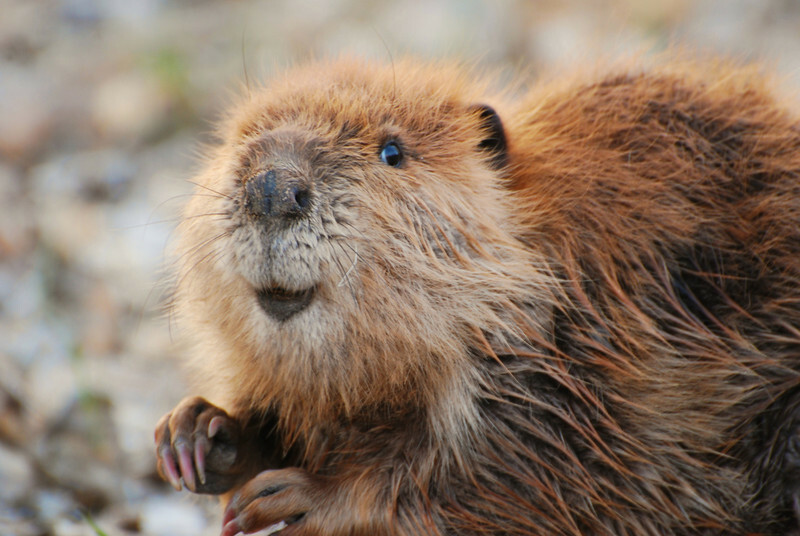 I’ve been a regular contributor to PMI’s Voices on Project Management blog for many years. Its old home was hidden in the depths of www.pmi.org. Following PMI’s purchase of www.projectmanagement.com (the old ‘Gantt Head’), the ‘voices’ have moved to join a number of other themed blogs on the site. The site is open to everyone, you need to register to post comments and download, but reading is free and unrestricted. My first post in this new location is Influence Without Authority. You can read the post at http://www.projectmanagement.com/blog/Voices-on-Project-Management/11149/pmi and then explore the rest of the site. There are two opportunities to make the holidays a springboard for you career in 2015. You last chance for a PMP or CAPM before Christmas is our 5 day intensive courses starting on the 1st December – these are timed to allow you to sit the exam in the week prior to Christmas. Alternatively make good use of the ‘silly season’ and book into the courses starting on the 19th January. Complete your training, enjoy the Australia day long weekend and be ready for work once Australia ‘wakes up’ after the summer break. We have published 3 papers recently that clarify and differentiate the functions of management and the functions of governance. M5 – To control (French: contrôller: in the sense that a manager must receive feedback about a process in order to make necessary adjustments and must analyse the deviations.). cascading down to lower level functions. These functions of governance were initially proposed in my ‘advisory article’: The Six Functions of Governance. Published in PM World Journal Vol. III, Issue XI – November 2014; download from here. A more focused discussion paper has been published today in WP1096 The Functions of Governance. Governance is the action of governing an organisation by using and regulating influence to direct and control the actions and affairs of management and others. It is the exclusive responsibility of the ‘governing body’, the person, or group accountable for the performance and conformance of the organisation (in a commercial organisation, the Board of Directors). But in many situations, particularly associated with the governance of project and programs, the governing of organisations is far from effective. The amount of time and effort devoted by the ‘governing body’ to compliance and accountability, and the amount of resources wasted by ineffective and ‘competing’ management groups, can be significantly reduced if the organisation’s objectives, ethics and culture are sound. Six core functions of governance are defined to bridge the gap between the ‘objectives of governance’ defined by Cadbury and others and the practices of governance defined by organisations such as the AICD. Hopefully discussion around the core functions of governance sparked by these papers will encourage improved governance performance.